Our feature article this year is a great example of how fun can be a part of what we do. We interviewed Mark Maloney of Bushy Park Circuit Inc. and got the history on the new race track development, the vision for the future, and how real estate is a major component of the sports tourism development. I do hope you will find that article informative and you will visit Bushy Park some time soon. You might even see me doing a few laps – so give me room. Our Knowledge Team has again developed some amazing, insightful reports that have helped us to understand trends in the market. I think you will see their work flowing through many of the articles by our team this year. We are now trying to reach beyond Barbados’ shores and tie some world economic indicators into the data in Barbados. We have found strong correlations between property values in Barbados and world currency and economic figures. As usual, we wanted to share keen observations from respected guest contributors. Town Planning Consultant, Richard Gill, "covers some aspects of Town Planning practice relating to policy and the control of development in Barbados," while renewable energy expert and entrepreneur, David Staples, asserts that “the time has returned for renewable energy to begin to reclaim some of its former dominance." Very timely. 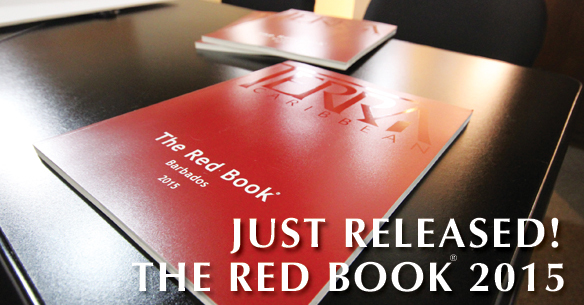 Earlier this year, the International Monetary Fund in its August report relating to tax reform in Barbados, referred to The Red Book as an “important publication” and quoted from some of the data in the 2014 edition. Certainly, this must be some acknowledgement that our goal to be a source of information on real estate matters, has significant credibility. I hope that you will find that this year’s edition is again true to this mission and that it will be help you make an informed decision.